(1) Baconnaise - Bacon Flavored Mayonnaise Spread (15 oz jar). (1) Bacon Mustard - Applewood Smoked Bacon Mustard (10 oz bottle). (1) Sweet Brown Sugar Candied Bacon (AKA Pig Candy). Sweet, smoky and a bit salty..thick cut candied Bacon. 3 Bacon Slices per box. (2) Chocolate Covered Bacon Strips (approx. 1 oz each).Two thick cut slices of crispy applewood smoked Bacon, covered in dark chocolate - topped with a drizzle of white chocolate. (1) Lowrey's Original Microwave Bacon Curls Pork Rinds (1.75 oz uncooked bag). (1) BIGS Sizzlin Bacon Sunflower Seeds (5.35 oz bag). (1) Chuao Maple Bacon Milk Chocolate Bar (2.8 oz). (1) Maple Bacon Salt Water Taffy (4 oz Bag). (4) Maple Bacon Lollipops (.25 oz each). (1) Redneck Cafe Bacon Hot Cocoa (single serve packet). ALLERGY WARNING - MAY CONTAIN MILK, NUTS AND/OR WHEAT. Products manufactured in a facility that handles tree nuts, peanuts, sesame seeds, milk, wheat & soy. PLEASE NOTE: Due to extremely high demand, we reserve the right to substitute items in this pack subject to availability. Any substitutions made will be of an equal or greater value. THE PIG OUT PACK IS OUR LARGEST BACON SAMPLER PACK! Perfect for anyone who wants to Pig Out on Bacon! This generous gift pack has savory snacks, sweet treats and tasty condiments - its got something for everyone! 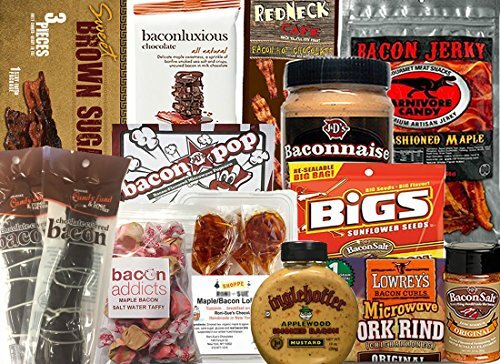 We all know someone who adores Bacon, and this Pig Out pack is a must have for every Bacon Lover! !